It doesn’t matter how clean your shower is – if you’ve got rust stains, it’ll always look dirty. Water with high iron content is usually to blame for those unsightly orange-brown streaks, but corrosion around fixtures can cause rust stains, too. So what can you do to remove rust stains from the shower? Scrubbing them with bleach (or bleach-based cleansers) may seem like the best option, but bleach sets the stains, interacting with rust to make the discoloration worse. Harsh chemical cleaners can ruin porcelain, scratch stainless steel fixtures, and damage glass or plastic shower doors. So you need a cleanser that’s gentle enough for delicate surfaces, but tough enough to power through rust. You need Bar Keepers Friend. For stains in the bathtub basin or on the shower floor, Bar Keepers Friend original powder cleanser is the go-to choice for rust removal. Make sure the surface is wet (but free of standing water), and sprinkle a small amount of cleanser on the rust, first testing it on an inconspicuous area. If stains are especially stubborn, you may need to add more cleanser, and a bit more water, to create a thick paste. Allow one minute for the cleanser’s oxalic acid to work its magic and break up the stain. Bar Keepers Friend is non-toxic, but to avoid skin irritation, put on rubber gloves before wiping the area with a wet sponge or cloth. If the stain is gone, rinse the area completely, and use a soft, dry cloth to buff the surface to a shine. If the stain is still visible, add more cleanser and water, as needed, and continue wiping with the wet sponge. For shower walls and doors, you need a cleanser that will cling to vertical surfaces: Bar Keepers Friend MORE Spray & Foam. 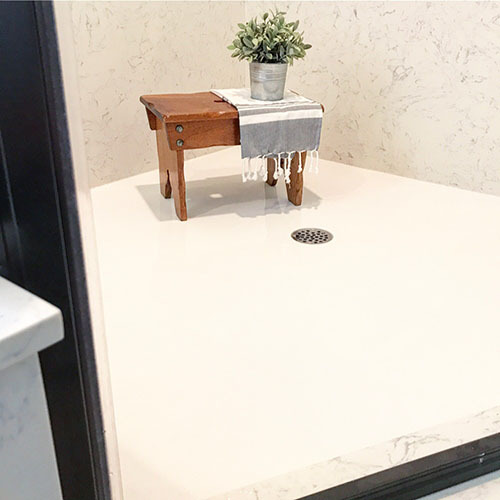 This cleanser is a gentler version of our powdered product, so it’s ideal for acrylic shower doors, grout and delicate tile (but do test this product on an inconspicuous area first, and don’t use it on natural stone). Choose the spray setting for spot-cleaning, or set the sprayer to the foam setting to cover a larger area (the foam also adheres to the surface longer). No need to wet the surface first – just spray the cleaner on the rusty area, and allow it to sit for one minute before scrubbing with a non-abrasive sponge and rinsing. As with the powdered cleanser, repeat this process until the stain is gone, then wipe the surface to bring out a lustrous shine. Once you’ve successfully removed the stains from your shower, keep an eye out for the first signs of rust – it will return, given the opportunity. If you notice that your white bathtub begins to look a little drab or off-white, that could be because rust is starting to form again. Use Bar Keepers Friend often to keep surfaces free of rust. Bar Keepers Friend isn’t just for rust stains in showers. That same product you rely on to make your bathroom shine can be used throughout your home, inside and out! 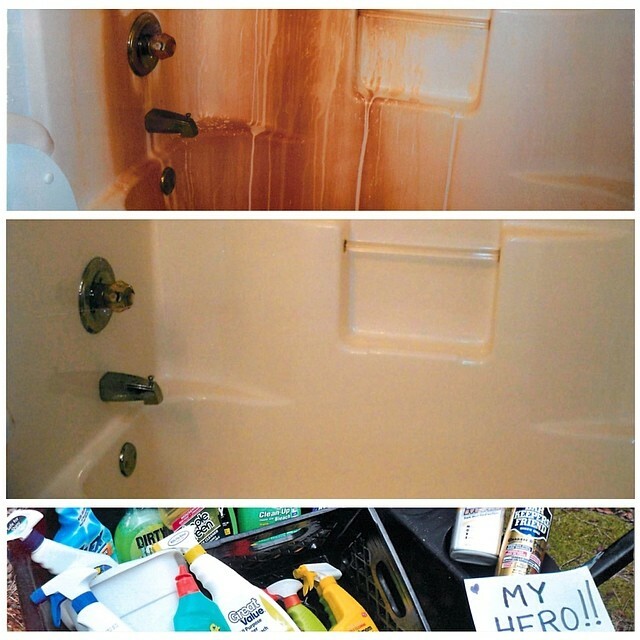 Have you used Bar Keepers Friend to clean rust stains from the shower? Share your #BKFBeforeAndAfter success story and it might be featured on one of our social media accounts, on our website, or even on a can of Bar Keepers Friend. Customer created video demonstrating Bar Keepers Friend removing rust stains from tub. Download our easy-to-follow guide on how to clean rust stains from the shower. The water at our lake cottage turns everything orange, Bar Keepers keeps our bathroom white and beautiful. Thank you! This product is AMAZING! That's all I have to say! I'm 7.5 months pregnant and can't stand the smell of most cleaning products! But this one does not smell strong at all compared to Ajax or other cleaners with bleach! We have super hard water and it takes me 2 hours to clean the stains off our shower! It took me 15 minutes with this product! Then I started cleaning everything in my house with it! The toilet, the sink, the grout!!! It has never looked so good!!!!! I will forever use this product! Recently moved and the previous owners told me how I needed to go online and order this expensive cleaning product to remove the rust from our very hard water. I decided to try a "tried and true" method. Only scrubbed for about a minute...No expensive product here, but fantastic results!